Plus, a “source” told Perez Hilton that the two are planning a July wedding in Rihanna’s native Barbados, complete with tattoo stations, naked waitstaff, firebreathers,and pre-rolled joints. But, no confirmation came from either of the singer’s camps, so we waited. And wondered. We waited to see just what the Grammys were going to hold for our favorite controversial pair. The two cuddled up together in the audience, and were definitely not shy about displaying that they are back together. Love ’em or hate ’em, there was no denying that these two have style, as Chris rocked it in his white tux, looking every bit the “angel”, perhaps trying to convey a new image? And RiRi, winning as always in the style department in a beautiful sheer Azzedine Alaia gown and $2 million worth of jewelry. And on her left ring finger? A small, thin, silver and diamond band. What the what?? Okay, everyone calm down. We don’t think Rihanna is engaged. First of all, does anyone really think that if Chris Brown were to propose to Rihanna, he would get her a small, discreet ring? Come on now. Nothing these two EVER do is small or discreet. 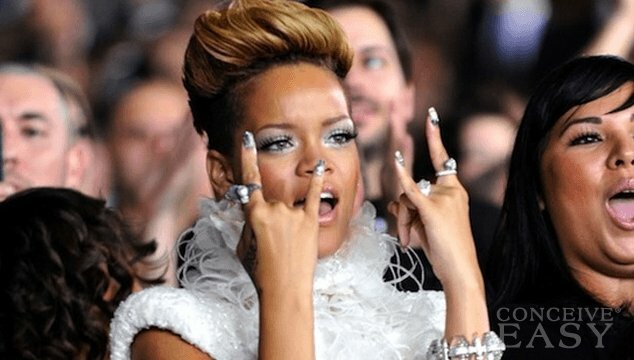 We know RiRi would have a rock so big that she couldn’t lift her hand. Fans of the couple are guessing this piece was just a promise ring. However, a rep for Neil Lane, the jeweler who loaned Rihanna the more than $2 million worth of jewelry that she wore to the Grammys, says that the ring was just a piece from the collection that Rihanna was loaned. Calm down everyone. Collective deep breath. Rihanna and Chris are not engaged yet. Or at least that we know of, anyways. However, an engagement announcement or even a wedding is probably coming in the near future for these two. They have been VERY public since rekindling their romance this past year. RiRi told Oprah last year that Chris is the love of her life. She also said in a Rolling Stone interview recently, that she doesn’t care what anyone else thinks about the two of them being together, and if it is a mistake, it’s her mistake and no one else’s. Sounds like these two are getting serious. And Chris recently told the Daily Star: “I love her and she loves me. That is what it comes down to. Our love is for life.” So, get ready. It’s probably coming, it just hasn’t happened yet.